The relatively new, Lilly Pilly ‘Backyard Bliss’ is a wonderful fast growing hedging plant. Reaching around 3m to 4m in height and easily pruned this is the perfect plant to use as a screen so that privacy from neighbours can be quickly achieved. This popular Australian hedging plant is a form of Syzygium panicutala, it is also resistant to Pysllids. This’ is one Lilly Pilly that retains good looking foliage year round. 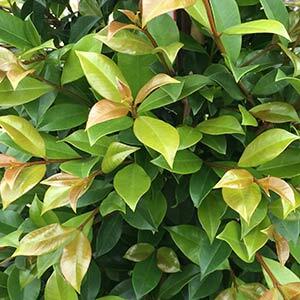 New foliage is an attractive orange to bronze, turning deeper green with age. Flowers are a creamy white in summer. An excellent plant for many areas in Australia where it will grow well from the temperate climates of Melbourne through to Sydney and sub tropical area from Brisbane to Cairns. Suited to full sun to part shade, however not really at its best in deep shade. For a good dense hedge plant at a distance or spacing of 1.5m apart. Although you can plant year round, the best time to plant is in late summer to autumn. The soil will still be warm which will encourage good root development, and you will not need to water as frequently. Best is a humus rich well drained soil. New plants should be watered through the first summer until the root system is developed. After a year or two ‘Backyard Bliss’ will require little water except in very dry years. Fertilize with a native plant fertilizer in spring. Pruning is very easy, and best carried out regularly to maintain a good bushy growth. You can hard prune if needed, and the plant will recover well in most circumstances. Pruning is best carried out in late winter, just before new growth begins. Height – Will reach around 3 – 4 metres in height. Spread is to around 1 – 2 metres. Foliage – Glossy green with bronze new foliage.